My Standard Two (equivalent to American second grade) school teachers disliked the fliers and their kites. The headmaster would storm out of his office trying to chase them off our school field whenever he saw them coming. The launching of these “wau bulan” was guaranteed to distract children stuck in the classrooms. It was wonderful watching a “wau bulan” leap into the sky, singing away. When school ended, we rushed out into the field, admiring the fliers and their magnificent kites. “Wau” means kite in the Kelantanese Malay dialect. “Bulan” is moon. The kite is called wau bulan or moon kite because the lower sail is shaped like a crescent moon. There are many other traditional Kelantanese kite designs. Some have swallow tail shaped lower sails. Others have sails with a higher aspect ratio and narrower “vents” between the upper and lower sails. By far, wau bulan are the most commonly seen designs soaring in the Kelantanese skies at the end of the North East Monsoon season. The wau bulan sings by means of a ribbon (the type you buy from gift shops) stretched over a bamboo bow. The assembly is clamped on the neck of the kite. The ribbon and bow combination resonates in the airflow resulting in a singing or humming sound. The pitch can be adjusted by using ribbons of different thickness and by varying the amount of tension. In the old days, leaves from a certain variety of palm trees were used instead of ribbons. The goal is to make a bow which produces a melodious tone. The bow is made from a single piece of dried bamboo. It tapers out to the ends from the center. The ribbon is made from ordinary ribbons available in arts and crafts shops. The two end plugs are made from bamboo tubes. I am not a kite historian nor a kite expert. Based on what I have seen, it may not be far off to say that the wau bulan has its origins from elsewhere in Asia. Or perhaps it has influenced the design of other South East Asian kites. 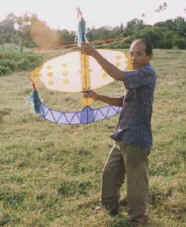 While the shape of the wau bulan is unique, elements of the wau bulan can be seen in other traditional kites in South East Asia and India, such as the Thai “hong song”, Indian “tukkal”, Indonesian “janggan” and Cambodian kites. Humming bows are found in Thai, Cambodian and Indonesian kites. Elliptical top sails are also found in kites from these countries. The difference is in the lower sail. Some are shaped like swallow tails, others like half ellipse. Traditional construction materials are bamboo, rattan and paper. The best wau are made from bamboo that has been cured in the sun for at least 2 weeks. The perimeter frame is made from sun-dried bamboo. The paper sails are further reinforced by a webbing of strings. Wau bulan are not flat kites. A skilled kite maker will ensure that the wings have a dihedral built in. The dihedral is induced by carefully cutting and gluing the paper sails on to the frame. It uses a 3-legged bridle with 2 lines going to the top of the kite. Furthermore, the lower crescent sail is also slightly angled relative to the upper sail. All this results in a light, sturdy and strong kite that rises easily, even in light winds. Leaves, vines and geometrical shapes are the commonly used theme in decorating wau bulan. The patterns are first hand drawn onto another piece of paper. The desired patterns are then cut out and pasted on to the sail. These are not appliques in the western sense. A heavily decorated wau bulan resembles stained glass art. However, you pay a price for the beauty. The elaborate decoration adds weight to the wau and affects its flight performance. Wau bulan that are made for flying have minimal decoration. Ismail bin Daud is the master wau maker who constructed the wau bulan you see in the pictures of this article. We call him Pakcik ‘Wan (means Uncle ‘Wan). He has been making them since the age of ten. In the mid-80s, he travelled to kite festivals in Germany, Italy and Japan under sponsorship from the Malaysian Tourist Development Corporation. He holds a day job with the Kelantan State Government and makes wau during his spare time. Pakcik ‘Wan says that what differentiates a high quality wau from a lesser wau is the bridling. He always checks the bridle settings before launching his kites. The wau in the picture has a 3-foot wingspan and is nearly 3 feet tall, constructed for light to medium wind conditions. This is considered to be medium sized. Large ones may have a wingspan exceeding 6-feet. Wau bulan are usually high launched. The name of the game is to fly the wau as high as possible and keep it up there longer than anyone else. Some fliers even leave their kites up in the sky overnight. The wau is capable of flying at angles in excess of 60 degrees. While they are not exactly “nailed to the sky”, they are able to stay up there without a lot of supervision. The real joy of wau bulan flying is to see the kite swaying and humming out a melodious tune while cooling off under a shady coconut tree. Traditional wau bulans are difficult to build, not easily transported and require tender loving care. As a novice kite maker, my personal ambition is to make them from modern materials so that they are robust and easy to transport while retaining the flight and musical qualities of traditional wau. Watch this space. This entry was posted in 1998, Issue 1 (Apr), KL Archive and tagged bow, Kelantan, malaysia, sound, traditional, Wan, wau.